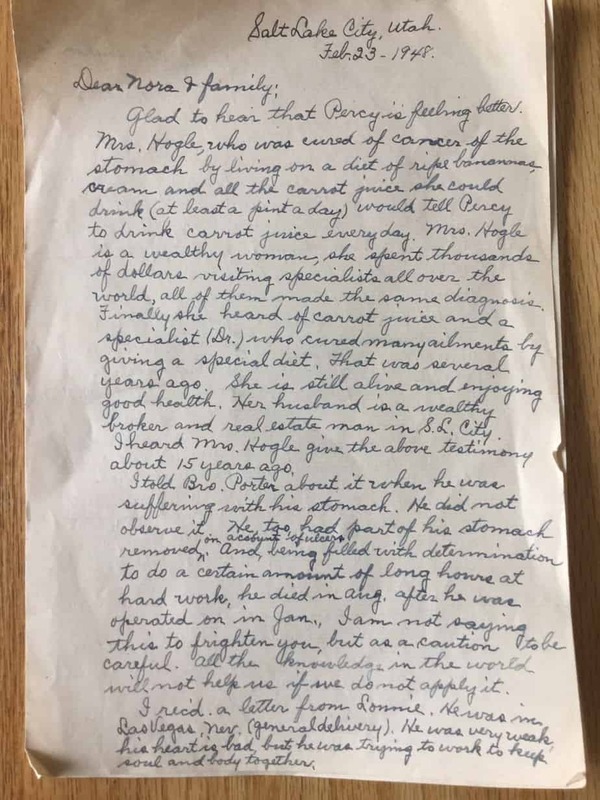 Sarah Louise Presnell Porter wrote a letter to her sister, Nora Presnell Farnworth (my great-grandmother), in 1948. 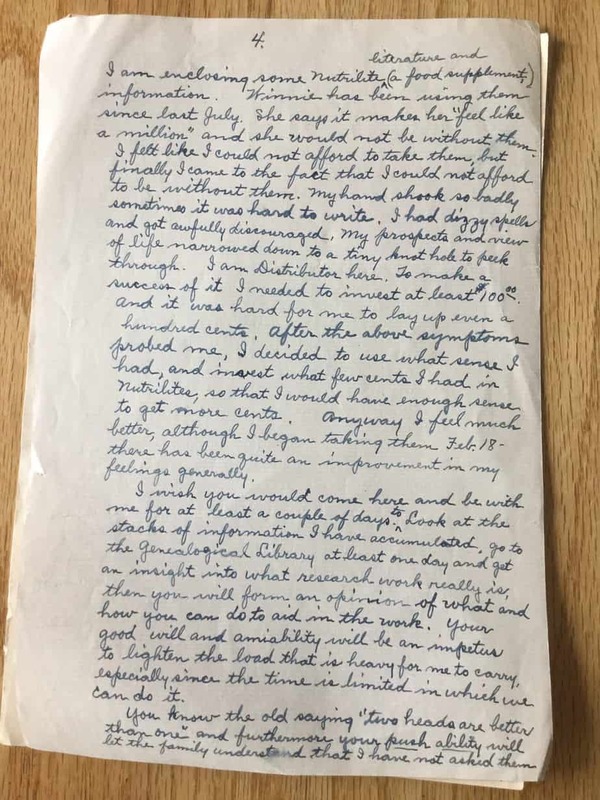 Her letter expressed her love of genealogy, and her lament that more family members were not involved in the work. 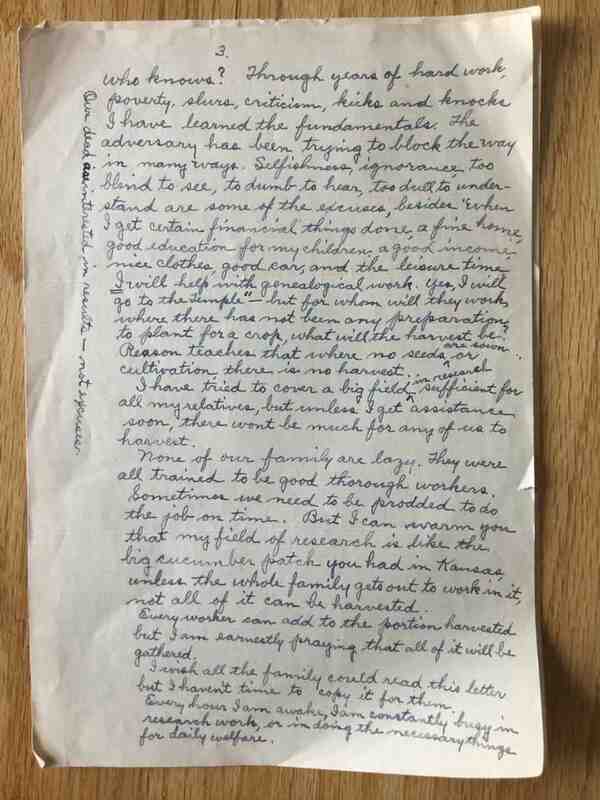 Sarah and Nora were members of the Church of Jesus Christ of Latter-day Saints, and her letter reflects the doctrinal beliefs that are core to LDS genealogy endeavors. Received a nice letter from Emily. She wished to learn genealogical research. There is more research information available and clues to be worked out than I can handle in my poverty stricken condition. I am like a drowning man who is about to go down the 3rd time. For years I have called for help, now if the tide sweeps away all my labors before I reach the goal— what can be done about it? I know where clues are buried but I need assistance to dig them out. Therefore what can we do to get the necessary information so that Temple work can be done? Who knows? Through years of hard work, poverty, slurs, criticism, kicks and knocks I have learned the fundamentals. The adversary has been trying to block the way in many ways. 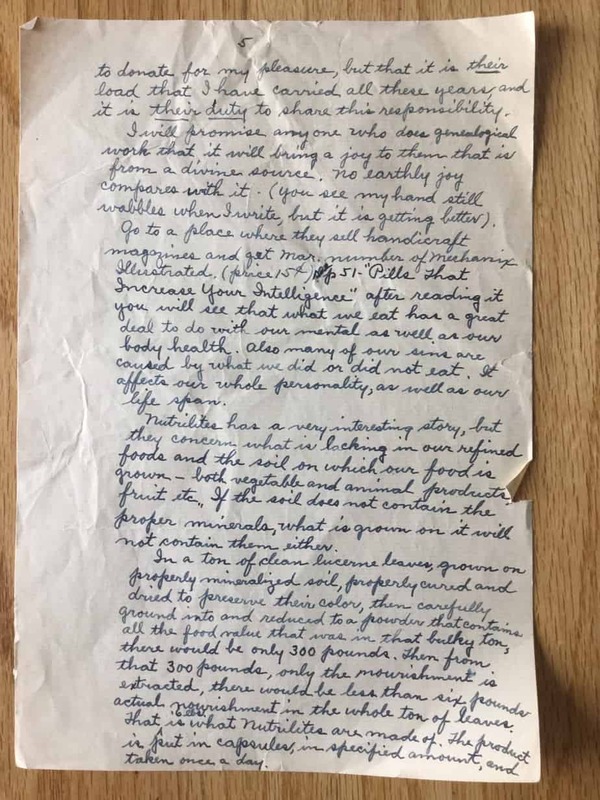 Selfishness, ignorance, too blind to see, to dumb to hear, too dull to understand are some of the excuses, besides “when I get certain financial things done, a fine home, good education for my children, a good income, nice clothes, good car, and the leisure time I will help with genealogical work. Yes, I will go to the Temple”- but for whom will they work, where there has not been any preparation to plant for a crop, what will the harvest be? Our dead are interested in results- not excuses. Reason teaches that where no seeds are sown or cultivation, there is no harvest. I have tried to cover a big field in research sufficient for all my relatives, but unless I get assistance soon, there won’t be much for any of us to harvest. None of our family are lazy. They were all trained to be good thorough workers. Sometimes we need to be prodded to do the job on time. But I can warn you that my field of research is like the big cucumber patch you had in Kansas unless the whole family gets out to work in it, not all of it can be harvested. Every worker can add to the portion harvested but I am earnestly praying that all of it will be gathered. 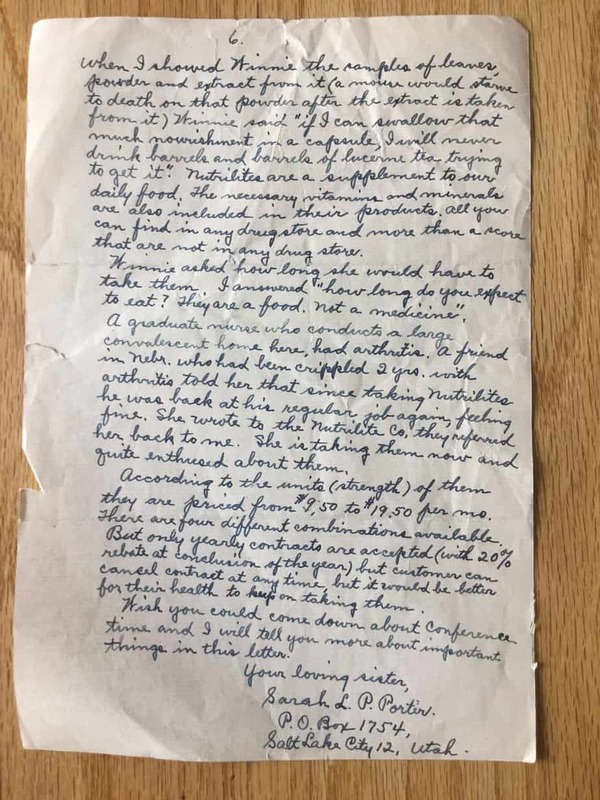 I wish all the family could read this letter but I haven’t time to copy it for them. Every hour I am awake, I am constantly busy in research work, or in doing the necessary things for daily welfare. 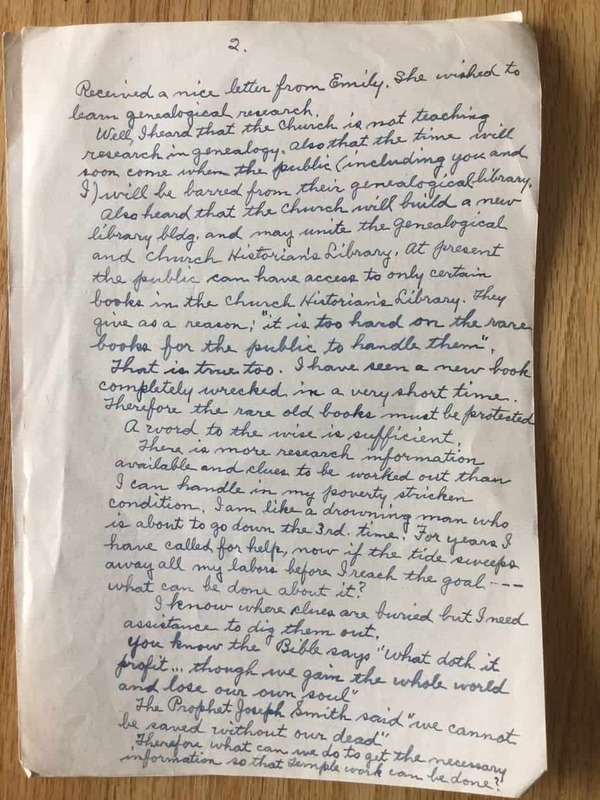 I wish you would come here and be with me for at least a couple of days to look at the stacks of information I have accumulated, go to the Genealogical Library at least one day and get an insight into what research work really is, then you will form an opinion of what and how you can do to aid in the work. Your good will and amiability will be an impetus to lighten the load that is heavy for me to carry, especially since the time is limited in which we can do it. You know the old saying “two heads are better than one” and furthermore your push ability will let the family understand that I have not asked them to donate for my pleasure, but that it is their load that I have carried all these years and it is their duty to share this responsibility. 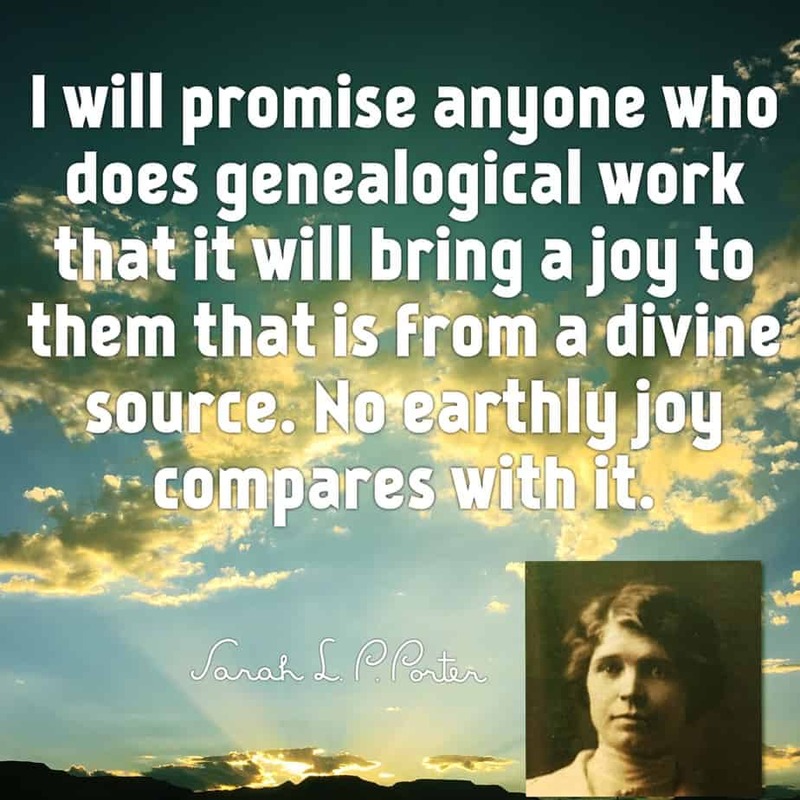 I will promise anyone who does genealogical work that it will bring a joy to them that is from a divine source. No earthly joy compares with it. *The transcription has been abridged to include only the portions pertaining to genealogy. Original letter in my possession. “Our dead are interested in results- not excuses.” That should be a poster! Agreed! 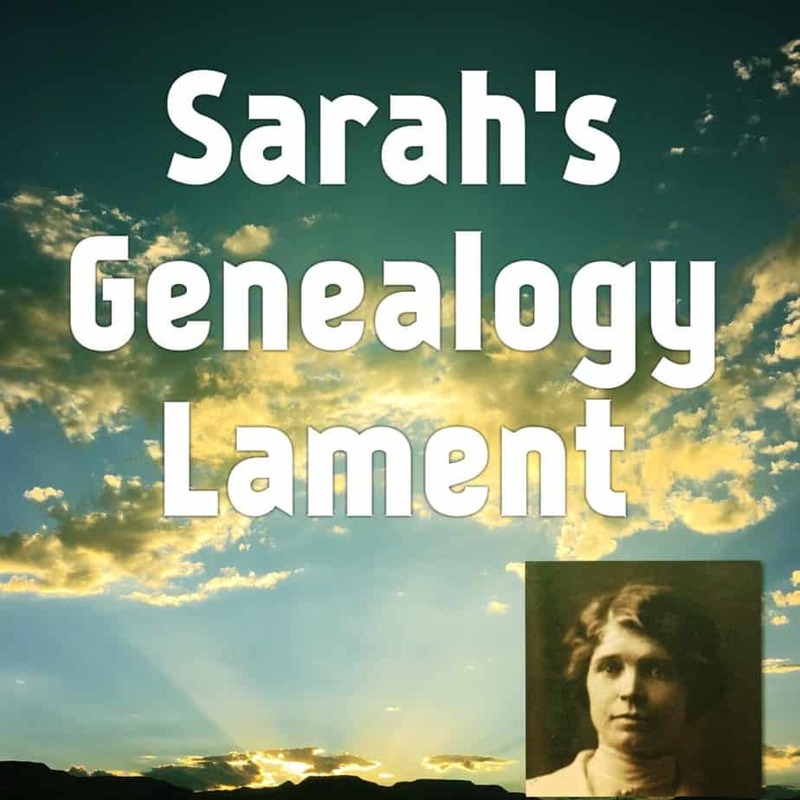 Sarah didn’t mince words in her passion for genealogy, did she?